Amazing donation of £10,000.00 received from Legg Mason today to go towards our next equipment funding..... speechless! What a donation!!! Welcome to TeamNoah, welcome to making a difference! 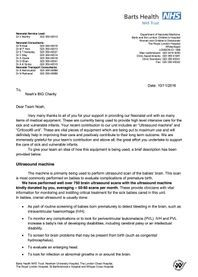 Today we received an update on how the equipment funded by NBC is being used on the NICU unit and the massive impact it has had in terms of frequency and benefit of use. From the cliff face you can see how NBC are making a difference... indeed how you have made a difference! #TeamNoah. Please click on the letter images below to read in full! We have just received this fantastic photo (Right) from the Basildon University NICU team. Amongst the fantastic staff you will see our latest funding purchases. This includes 4no. 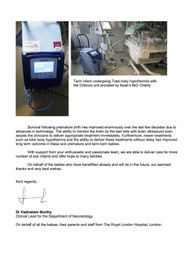 'Masimo Saturation monitors'; these pieces of kit are in great demand and constant use and are vital on the unit to monitor babies oxygen requirements 24/7. The larger machine at the centre of shot is a 'Cerebral Function Monitoring Machine' (CFM). This is a valuable machine for diagnosis and treatment. it monitors brain activity especially in babies born in poor condition and where there are fears of oxygen deprivation at birth. Again a massive thank you to all our supporters and the team on ward. With out all of you NBC couldn't continue to make the difference we are. We are delighted to let everyone know that we have just sent a cheque for £12k to fund a further Criticool unit for the Royal London NICU. 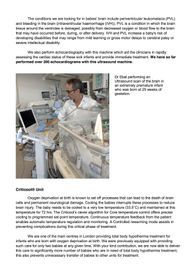 Our last Criticool purchase has literally saved lives and by having an additional unit on ward the treatment can be offered to more babies at any given moment. A colossal thank you to all of those who have contributed to #TeamNoah allowing us to continue making a difference! 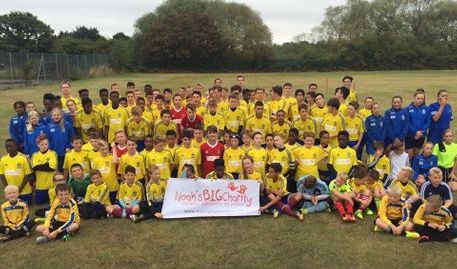 Good luck to the biggest #TeamNoah to ever take on a challenge today! 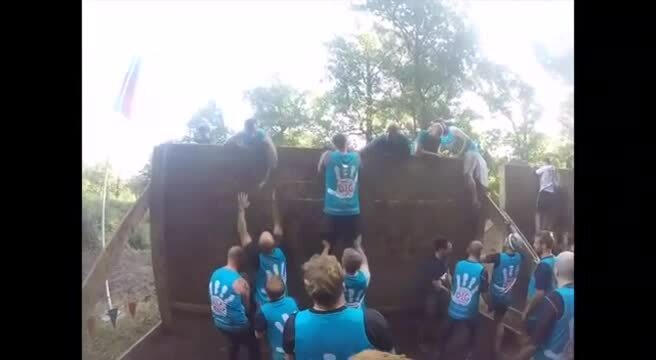 Led by Adam Benee a fellow NICU Dad has rounded up 25 great people to take on the Tough Mudder endurance obstacle course. The team have raised in excess of £6,000.00 and are still going strong. Huge thanks and good luck again to Adam and Co.
Big thank you to Jane Cornish a former NICU mum, who ran the Kenilworth Half Marathon supporting us. She romped home in 2h 08m having raised an astonishing £1,120.00 before gift aid. Colossal effort jane, thankyou! Right: Jane and family post race and looking fresh. In fantastic news, we are delighted that together with some much welcomed match funding to come from Barclays, AXA IM & BNY Mellon, our Ride 100 team look set to have raised over £8000.00 including gift aid! What a stirling effort that will be able to make a tremendous difference on our supported NICU's! Well our team made it safely around the Ride100 course. Some judging by the times were trying to make last ditch attempts for Rio! Fantastic effort from one and all! Above Right: Yves Berger enjoying a well earned beer after posting an incredible 4:39:03 time. Right: Nick Soothill looking very pleased with his efforts as he should be following 100miles under his belt and a good deal raised for NBC. 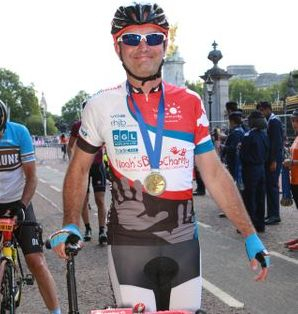 Good luck to our Team Noah in the Ride 100 on Sunday! The team have raised over £4,500 before gift aid.... What a fantastic amount that will truly make a difference!! Thank you. Fantastic surprise in the post today as a cheque for £666.66 landed form AKT who continue thier support for NBC this year, as one of their designated charities. Thank you to all the fantastic staff who contributed. Our fantastic 7 riders are in the final stages of training for the Ride 100 event on 31st July and have already raised almost £4,000! 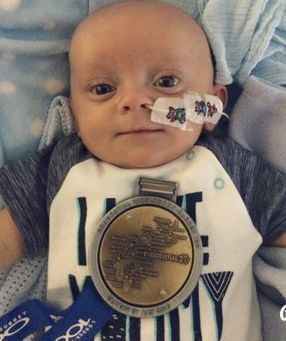 Keep up the efforts #TeamNoah you're doing brilliantly! Good luck to all the ladies being rallied by good friend of the charity Danica Fordham for #TeamNoah, taking on the 5k Color Obstacle Rush at Kempton Race Course tomorrow. Hope the rain stays away and you have great fun supporting the charity. Thank you for your efforts. Good luck to all those taking part in the NBC Golf Day 2016, being held at Romford Golf Club for the 3 consecutive year! Looking like a sunny day, so some good fun and good funds to be raised! Following a chance meeting with the CEO of Texcel Developments, where one of our wristbands was spotted, the Texcel charity team agreed to donate £750 in support of NBC. Thank you to Graham Bryce and all the team at Texcel. We are delighted to announce that AKT II The prestigious London based Structural & Civil Engineers have made NBC one of their Charities of the Year. AKT have very generously donated £1000 to show their commitment to start, with further fundraising planned throughout the year! A huge thank you to the entire AKT II team, with special mention to Jay Harrison. 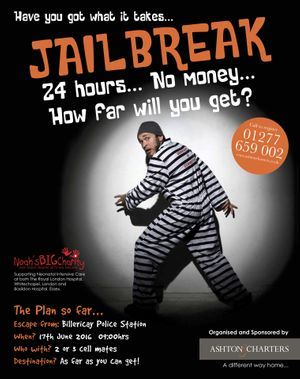 11.04.16 There's gunna be a JAILBREAK!!! It's hard to believe that it is 3 years ago today that we had to say goodbye to our little guy Noah. It is a sad day for us, however we take great comfort in the contribution our little charity bearing his name has made in this time! Thank you to everyone that has made and makes Team Noah. Together you have spared many many parents a tremendous pain, getting more babies home! A huge thank you to the friends and family of Noah's Nanny, Yvonne Hobden, who following her passing donated £1,745.00 at her her funeral to Noah's Big Charity. A heartfelt thanks from us all. She would be so proud to know that she was still able to help! Thank you to the members of the Brentwood a Becket Rotary Club who welcome Richard to their meeting yesterday, to give a presentation and take questions about NBC. The night was well received by the group who previously donated £2,000.00. Thank you to all present, great evening and now a few more enlightened people. We recently had the pleasure to cross paths with Stuart Rogers and Fiona MacGregor. This great couple donated the last 40 of their stock of Kangaroozaks. 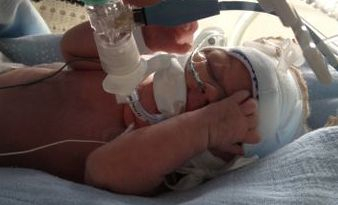 This great product allows parents to prolong effective kangaroo care with their premature baby. So 3 brave souls have taken places for #TeamNoah in the Ride London 100 and they need you to complete the team..... 5 places left!!!! We have 8 places for this years iconic cycling event held in London and Surrey on Sunday 31st July. If you were not lucky in the ballot please get in touch. if you were lucky to receive a place still get in touch and become part of #TeamNoah2016! We would like to extend a huge thank you and good luck to Polly St.John who left RLH NICU today for pastures new. Polly played a pivotal role in Noah's care and has since been an integral part of the NBC family. Good lucks Polly! 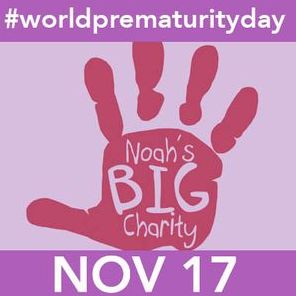 Today would have been Noah's 3rd Birthday.... the little guy has galvanised life changing support for numerous babies and their families with immeasurable impact! Twinkle bright little man!